Dear readers, I’m so happy to see that this is my most read article in my blog and I hope many people have had a chance to taste this amazing experience after me. The info I give here is probably outdated since I did this trip a few years ago. If you have more updated information, please leave a comment and share your experience for the adventurers coming after you. Thank you. Buen viaje! We concluded our stay in Leticia (Colombia) on Friday, Jan 24 by taking a cargo boat from Santa Rosa, Peru at 7:30 pm. We arrived in Iquitos, Peru at 12:30 am Sunday, Jan 26. For clarity’s sake: Brazil, Colombia and Peru intersect in this part of the Amazon. You can cross from one country to the other in a few minutes with a taxi or boat without showing id or passport. It was funny to see the languages in the signs and even the time zones changing so quickly! As a result of a slight miscommunication with the cab driver who picked us up in Leticia, we ended up boarding on a small boat from Tabatinga, the Brazilian town next to Leticia that brought us to our main boat on the Peruvian side. So we changed 3 countries within an hour! Once we got to the boat, which looked like it was from the 1800’s, a bit hesitant yet happy smiles appeared on our faces up until we realized that we hadn’t gotten our passports stamped for our entry to Peru. Luckily I was able to do that for both my friend Daria and myself by jumping up and down to stop a canoe on the river to take me to the passport office in the village of Santa Rosa right across the river. In the meantime Daria set up our hammocks and waited by our huge luggages on the boat. Since we were told the meals they served on the boat would be beyond edible, we tripled our luggage size by buying a ton of fruits, bread and other pastries, cereal, milk, galetas, water, etc. However, we were pretty happy chowing down the chicken/rice/frijoles plates served fresh from the kitchen twice a day and munching on fruits and nuts in between meals. We were also able to buy coffee on our 2nd day! The little food stand on the boat sold colorful inca kola, beer, candies, and little unhealthy looking snacks. We could also buy fruits, coconut, tamales, and fried fish from the ppl who jumped to our boat during the short stops here and there. The bathrooms on the boat were the biggest concern for us but we got used to them by staying away from them during the daily shower rituals. The 5 tiny bathrooms on the boat contained shower heads above the toilets that pumped (boiling hot) water from the Amazon river and apparently our fellow passengers had the habit of using them pretty often. The excess of the shower water remained in the bathrooms until a staff member swept it away, which didn’t happen frequently. We were forced to develop acrobatic moves every time we needed to use the steamy bathrooms to stay away from the dirty water on the floor and squat on the toilets without touching anything unwanted. We put up our hammocks on the top floor, which was way quieter and airier then the first floor. I was surprised to see how crammed the hammocks (of the locals) were on the bottom floor and how they slept in the disco music blasting from ppl’s phones and the kitchen of the boat day and night. We made friends with Greg, an American backpacker from Arkansas who got on the boat at the same time with us and we watched each other’s stuff when one of us went away from the hammocks. 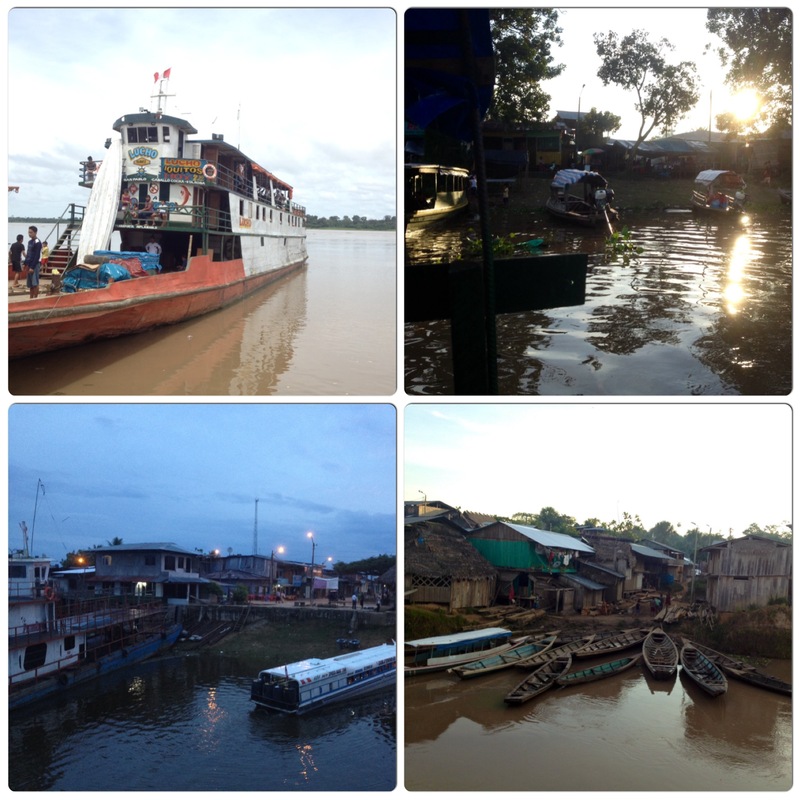 On the second day, 4 French backpackers boarded on the boat to join us in the rest of the trip to Iquitos. We were the only foreigners on the boat that carried locals in between the towns along the Amazon River and everybody was very sweet and smiling to us. The boat was really slow and stopped in so many towns along the Amazon River. In each town a flood of ppl got on and off. We had humans, puppies, and babies around us all throughout the trip. Even tough it seemed challenging to travel on this boat for 3 days in the beginning, time flew by and it was super fun to open our eyes in a new tiny Amazonian town every time the horn of the boat woke us up. We arrived to Iquitos at 12:30 am on the night connecting Sunday to Monday and decided to sleep on the boat until the following day along with the 90% of the boat. I associated our look from outside to a scene from a human trafficking movie, us being the illegal immigrants waiting to be sold for work. The next morning at around 5 am, all the children, dogs, roosters and cellphones decided to wake us up all together in harmony. 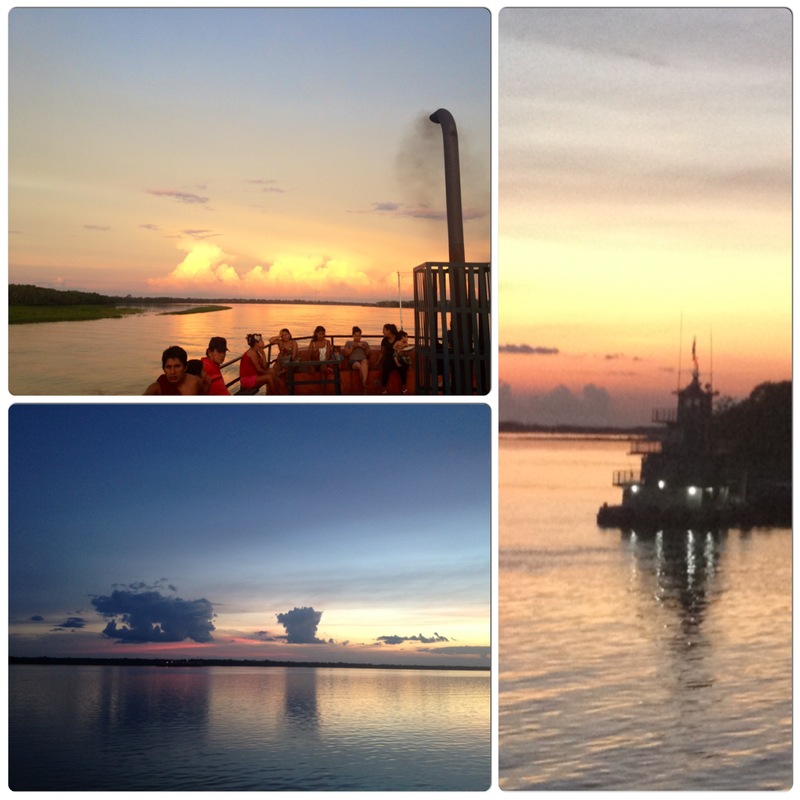 The sunset and sunrise on the Amazon River were both breathtaking to watch. Hey I would love to talk to you more about details in regards to this trip, do you have an email I can contact you on? Planning a trip to August so this would very useful, thank you!